It’s not even twenty days until the solstice, and at 3pm, it’s still fairly light out. It’ll be getting dark within the next hour, hour and a half–and 5pm will seem like night. It’ll get light again a little after 9am. I thought I was adjusting well, until I realized that, yeah, I’ve been tired all the time for the past couple of weeks. It might be the amount of light. I don’t know. It’s also not that cold. It’s gotten above freezing, several days this week. Anyway, the solstice is coming up. 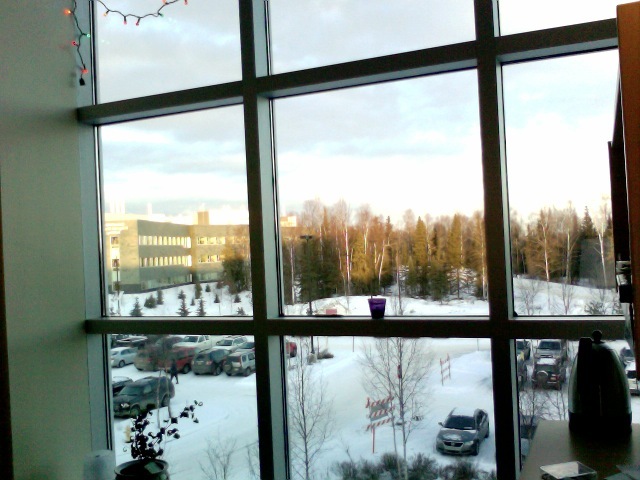 December 21, Anchorage – Civil twilight: 9:12am. Sunrise: 10:14am. Sunset: 3:41pm. End civil twilight: 4:44pm. (And on the 22nd, it’s all the same, except that sunrise and sunset *both* happen one minute later. For comparison, Pittsburgh – Civil twilight: 7:09am. Sunrise: 7:40am. Sunset: 4:57pm. End civil twilight: 5:27pm.) I think I may arrange to go home early that day, so that I can leave a candle lit through the entire night–I’ve always liked that tradition (or religious observation, depending), and it seems more important, up here, somehow. It’ll be brighter out, again, by the time Dale gets here, than it is now. It may still seem a little weird for him, but not nearly as weird as it might if he were coming for Christmas.